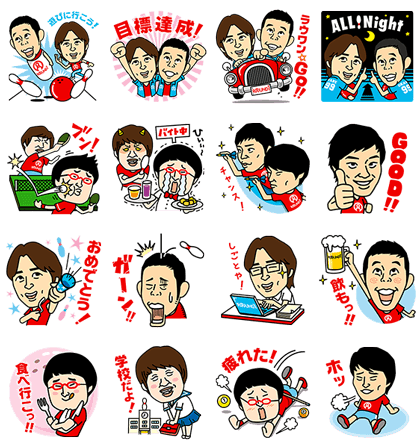 http://www.line-stickers.com/ – Round1 & Yoshimoto Comedians Line Sticker | Hilarious stickers from the popular commercial featuring the Yoshimoto comedians. A second set of hilarious stickers perfect for cracking your friends up. 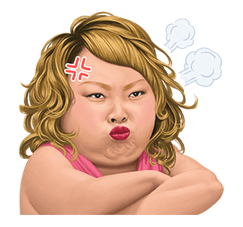 Entertainment wonderland Round1 and the side-splitting comedians from Yoshimoto have teamed up to bring you a 3rd round of hilarious stickers. And next installment of the popular Yoshimoto & Round One stickers is here! These comedians will bring all your favorite quotes and have all your friends in stitches! At 5th round, sit back and laugh as your favorite comedians from TV turn your chats into a laugh-riot. Friend the Round1 official account to get this set. Available till December 8, 2014. Bikkuriman teams up with Yoshimoto for this fantastic sticker collaboration! An all-star cast of Yoshimoto entertainers gets the Bikkuriman treatment. You don’t need to worry about collecting each one though, with this set you’ll get them all at once! Use them to fill your chats with laughter!